Promoting a culture of health and wellness in Floyd County, Virginia by offering diverse opportunities that encourage all members of our community to live a positive, healthy lifestyle. 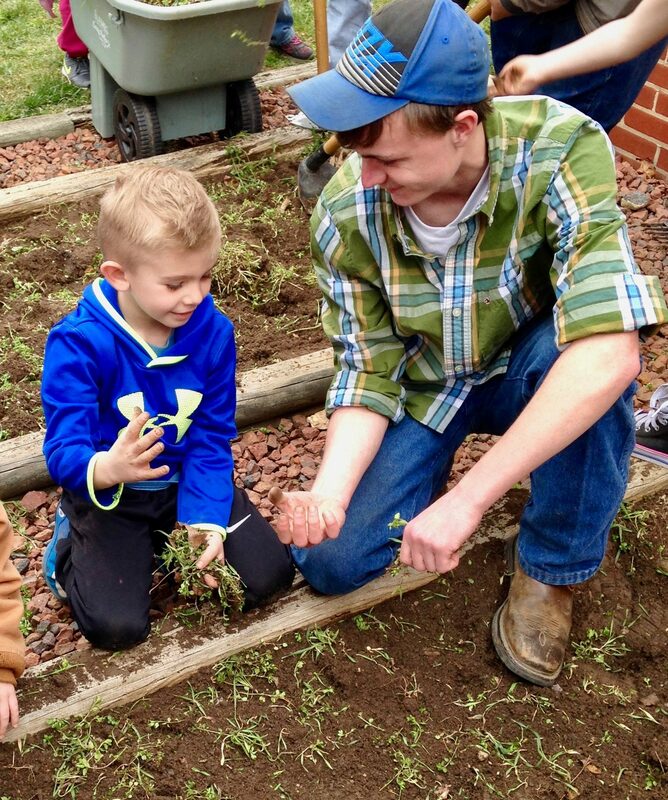 Floyd County students learn where their food comes from with Healthy Learning Gardens! Playing in dirt is healthy for kids! We’d love to see you on September 14th for our second annual Healthy Floyd 5K. Click here for details and registration info. Did you know a 20 oz. cola contains twice the sugar content of a double-dip ice cream cone? Students learn to read nutrition labels and discover just how much sugar is added to popular foods and beverages. Preschool and elementary students try out new veggies and healthy recipes cooked up by Floyd High School Culinary Arts students. All Healthy Floyd nutrition programs (Preschool Produce, Sugar Smarts, Learning Gardens) also include yummy fruit and veggie tastings. School and community Learning Gardens demonstrate the fun and delicious benefits of growing healthy foods locally, especially in your own backyard! To increase vegetable consumption, Healthy Floyd provides preschool families with free, fresh, local produce, plus recipes and tips for easy preparation. 95210 is a national campaign implemented locally by Healthy Floyd. Don’t know what it means? Learn more here, or just ask a kid in Floyd! Join us for weekly work-outs at the Jessie Peterman Memorial library. Local farms provide hands-on farm experiences and healthy eating inspiration and education for Floyd County students. There are so many great ways to be involved. Click here to get started. We look forward to hearing from you! Be sure to LIKE our Facebook page to keep up with the latest happenings! Weekly Workouts with Floyd Moves It! 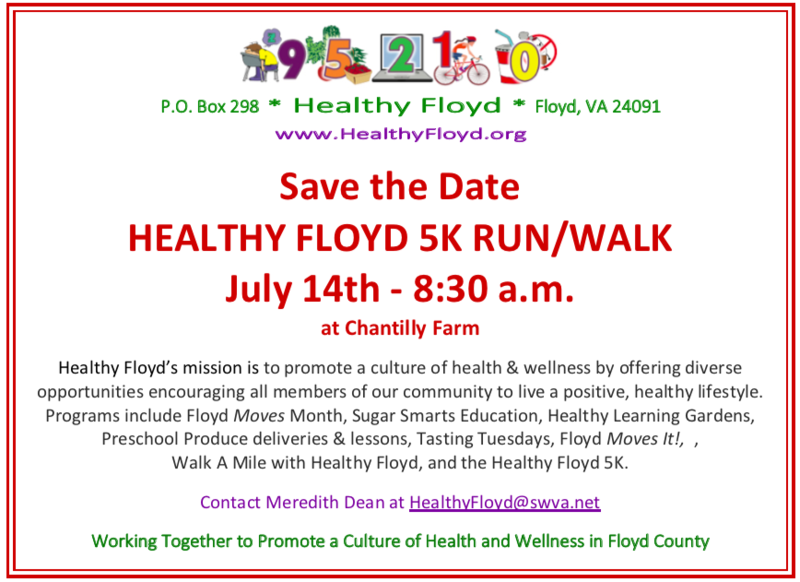 In 2010, Floyd was awarded support through the Virginia Foundation for Healthy Youth (VFHY) to conduct a community needs and resource assessment resulting in the Healthy Community Team (HCTeam) and the Floyd County Childhood Obesity Prevention Plan. Since then, VFHY has continued to support the HCTeam in its efforts to improve the health and well-being of Floyd County families. In 2016, the HCTeam incorporated as its own local non-profit, HEALTHY FLOYD. Partner organizations include Virginia Foundation for Healthy Youth, Floyd County Public Schools, Floyd/Floyd County Parks & Rec., Citizens Cooperative, NRV Community Services, Virginia Cooperative Extension (VCE), Plenty!, the June Bug Center, NRV Head Start, New River Community Action, FCHS FCCLA, Women’s Committee of Floyd County Farm Bureau, The Floyd Press, Floyd Town Council, Jessie Peterman Memorial Library, Floyd County Multidisciplinary Team, Milestones Childcare Center, Floyd Rotary Club, Tri-Area Community Health Center. Other community supporters have included the Barter Clinic, Blue Ridge Center for Chinese Medicine, Collins Chiropractic Clinic, Floyd Carilion Clinic, VA Department of Health, Floyd Pharmacy, Floyd Baptist Preschool, Calvary Baptist Preschool, Floyd Farmers Market, Food Lion, Floyd Rotary Club, Clark’s Gas and Oil, Bank of Floyd, Profitt & Schroeder Attorneys, Healing Tree, Heart of the Child Music, Jim’s Grill, Slaughter’s Grocery, Harvest Moon, Mickey G’s Restaurant, Ray’s Restaurant, Subway, Blue Ridge Motion, Tuggle’s Gap Restaurant, Floyd Country Store, Jacksonville Center, Black Water Loft, Mitchell’s Music, School House Fabrics, Wooly Jumper Yarns, Back Porch Dance Studio, Floyd EcoVillage, Floyd Fitness, Floyd Recreation Department, Great Oaks Country Club, Rutters Martial Arts, Dr. Conduff, and French Family Dentistry. Healthy Floyd’s Mission is to promote a culture of health and wellness by offering diverse opportunities encouraging all members of our community to live a positive, healthy lifestyle. Save the date for our first 5K Run/Walk! Look No Further. Read Our Most Recent Posts Below.